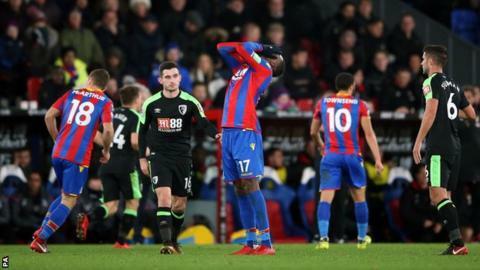 Christian Benteke went against manager Roy Hodgson's orders to take the injury-time penalty he missed in Crystal Palace's 2-2 draw with Bournemouth. Cherries goalkeeper Asmir Begovic pushed away Benteke's weak effort as a rollercoaster encounter ended with the points shared. Palace boss Hodgson said: "It was a unilateral decision, no-one on our team was able to wrest the ball from him." The visitors had taken the lead when Jermain Defoe fired low into the bottom corner from Andrew Surman's cross. Luka Milivojevic, who initially lined up the injury-time spot-kick, buried a penalty awarded for a foul on Wilfried Zaha, before Scott Dann steered home Yohan Cabaye's ball across the face of goal. Defoe's second - a superb, dipping half-volley - sent the teams to the break even. There were no goals in the second half, but no let-up in the entertainment either. Palace finished the stronger, with Dann stabbing over and Benteke squandering his chance from 12 yards. But even as the final whistle blew, Bournemouth were appealing in vain for a penalty. The result, combined with Swansea's win, means Palace return to the bottom of the Premier League table. Palace's Premier League season began with seven straight defeats. Bournemouth started with four successive losses. Both have since improved markedly and, if they replicate the appetite for the fight on display here, they are well prepared to resist relegation. With Hodgson giving Andros Townsend and Wilfried Zaha licence to roam far and wide, there will be plenty of other teams that struggle to pin down the Palace attack this season. And the former England manager will feel that, having managed 24 shots at goal to Bournemouth's 11, his side should have converted their pressure into points. But his inquest will begin with Benteke's decision to take on penalty responsibilities at the death after Milivojevic had emphatically converted in the first half. The Belgian's run-up lacked conviction and culminated in a tentative shot that was pushed away by Begovic. The £27m striker is yet to score in 11 games this season. "We the management decide who the penalty takers are and we don't expect players to change those decisions during the course of the game," Hodgson added. "We tried to shout out our instructions, they obviously didn't reach the penalty spot." When Defoe returned to English football from MLS side Toronto FC three years ago, there were plenty who questioned whether the then 32-year-old still could cut it at the top level. Thirty-four league goals for a Sunderland side that was relegated at the end of last season answered that question. With 35 years on the clock, the electric pace that was once the bedrock of his game has gone. Here, James Tomkins, who would not have had a chance of reeling him in a decade ago, was able to get back and make a tackle when it seemed Defoe was clean through in the first half. But Defoe's technique is still very much intact. If his first was an assured first-time finish, his second was simply sublime. There seemed little danger as he chased a bouncing ball towards the byeline, but Defoe swivelled suddenly to unleash a shot over a startled Julian Speroni, under the crossbar and into the far corner from a tight angle. His 200th and 201st league goals come 17 years and two months after his first - scored in a third-tier match for the Cherries in October 2000, during his first stint at the club. Zaha to come under the microscope? Everton forward Oumar Niasse became the first Premier League player banned for diving when he was found guilty of "exaggerating the effect of normal contact" to win a penalty against Palace last month. Palace were the wronged on that occasion, but could be in the dock themselves after Zaha went down to win his team's first penalty. Neither the backtracking Nathan Ake nor the advancing Begovic seemed to make significant contact with the Ivory Coast international before he hit the turf. Even with repeated replays, it was difficult to untangle whether there was any deliberate attempt to trick the official however, underlining the difficulty of such cases. Defoe had three shots on target, more than any other player. One was his sumptuous second goal. Crystal Palace manager Roy Hodgson on the injury-time penalty: "We expected Luka to take it, he's our designated penalty taker. "For some reason Christian persuaded him to let him take it, and then he missed it. "I think Christian is stunned, shocked and very disappointed. "But I actually thought he played well, that's the best I've seen him play in a Palace shirt in my time here. "It's a great disappointment. Rather than crown that performance he's put himself in a bit of a black hole with Palace supporters because he's missed." Bournemouth manager Eddie Howe on Jermain Defoe's goals: "They were two really good finishes. "They are totally different finishes as well. "For the second, from that angle he's got no right to score, and that's his unique talent." Benteke has missed three of his five penalties for Crystal Palace in the Premier League, including each of the past two. Palace have drawn three consecutive games in the Premier League for the first time since May 2005, when they were managed by Iain Dowie. Bournemouth have dropped 10 points from winning positions in the Premier League this term; a joint-high alongside Watford and West Brom (also 10). Defoe has netted nine goals in his past 10 league appearances against Palace, scoring in each of his past three games at Selhurst Park. Defoe has scored twice in each of his past three Premier League appearances against Palace; his longest such run against a single opponent. There were just seven minutes and nine seconds between Palace equalising (Milivojevic), going 2-1 ahead (Dann) and Bournemouth making it 2-2 (Defoe). Dann is the first central defender to score in four consecutive Premier League games against the same opponent. Bournemouth's opener was their first goal in the opening 10 minutes of a Premier League game this season. Crystal Palace play Watford at home on Tuesday before playing Leicester on Saturday. Bournemouth travel to Manchester United on Wednesday before entertaining Liverpool the following Sunday. Match ends, Crystal Palace 2, Bournemouth 2. Second Half ends, Crystal Palace 2, Bournemouth 2. Attempt blocked. Callum Wilson (Bournemouth) right footed shot from the centre of the box is blocked. Assisted by Andrew Surman with a headed pass. Corner, Bournemouth. Conceded by Bakary Sako. Attempt saved. Luka Milivojevic (Crystal Palace) right footed shot from the centre of the box is saved in the bottom left corner. Attempt blocked. Luka Milivojevic (Crystal Palace) right footed shot from the left side of the box is blocked. Assisted by Jeffrey Schlupp. Corner, Crystal Palace. Conceded by Simon Francis. Penalty saved! Christian Benteke (Crystal Palace) fails to capitalise on this great opportunity, right footed shot saved in the bottom left corner. Penalty conceded by Charlie Daniels (Bournemouth) after a foul in the penalty area. Attempt blocked. Wilfried Zaha (Crystal Palace) right footed shot from the centre of the box is blocked. Assisted by Christian Benteke. Offside, Crystal Palace. Scott Dann tries a through ball, but Ruben Loftus-Cheek is caught offside. Attempt blocked. Wilfried Zaha (Crystal Palace) left footed shot from the left side of the box is blocked. Assisted by Luka Milivojevic. Attempt missed. Luka Milivojevic (Crystal Palace) left footed shot from the centre of the box is close, but misses to the right following a corner. Corner, Crystal Palace. Conceded by Asmir Begovic. Attempt saved. Ruben Loftus-Cheek (Crystal Palace) right footed shot from outside the box is saved in the bottom left corner. Assisted by Wilfried Zaha. Substitution, Bournemouth. Callum Wilson replaces Jermain Defoe. Attempt missed. Scott Dann (Crystal Palace) right footed shot from the right side of the six yard box is too high. Assisted by Christian Benteke following a set piece situation. Attempt missed. Christian Benteke (Crystal Palace) header from very close range misses to the right. Assisted by Andros Townsend with a cross following a set piece situation. Attempt missed. Jordon Ibe (Bournemouth) right footed shot from outside the box is high and wide to the right from a direct free kick. Jermain Defoe (Bournemouth) wins a free kick in the attacking half.